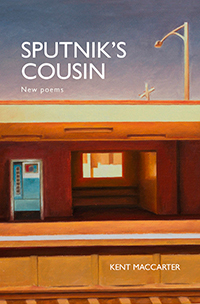 Sputnik’s Cousin by Kent MacCarter. 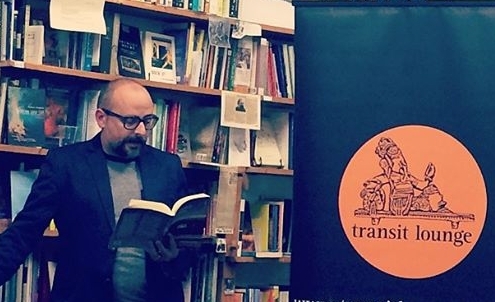 Transit Lounge 2014 was launched by Gig Ryan at Collected Works Bookshop in Melbourne on 14 May 2014. Here is what she had to say…. It seems clashingly right to launch Kent MacCarter’s Sputnik’s Cousin the day after the federal budget – while Joe and Mathias chomp cigars, we can chink glasses to celebrate an untaxable uncuttable un-levy-able complex work of art, knowing that it’s as far outside this Liberal Government’s comprehension as a person unemployed and under-30 would be, and if, in some alternative universe it was comprehended, it would be sent direct to Australia’s latest asylum seeker centre in Cambodia, or drowned at sea in the new Orwellian forms of compassion we have come to expect from those weeping over their speeches in Parliament. This book in part tracks the poet from youth to maturity to fatherhood, as he careens through a universe of Twentieth and Twenty-First century chaos from Mexico to Macedonia, market forces, memes and mantras of anxieties and amusements – enfolding a critique, and slanted analysis, of all things Now, as well as some rueful summings up of some things Then in jigsawed apologias of past experience. Migrations zero in on fraught states and wondrous sceneries, a guidebook to the world equals a guidebook to the poet’s feverish deracinated mind, all in some newly bursting MacCarterian Esperanto. Kent’s language curls around all matter like Darwin entranced, or the glimmering blades of grass in a Terrence Malick film, as he plays and puns and rhymes through pantoums and longer poems, as well as some long prose accounts – a Luna Park of treasures, tricks, and terse bundles of matter: there’s a weird history, or portrait, of Melbourne’s inner North, a long riff on jazz musician and composer Bix Beiderbecke (‘fleeter than Art Deco or a cheetah hunt’ – Bix dropped dead at the age of 28 in 1931, from pneumonia, thought to have been exacerbated by alcoholism), Houdini in Australia, the 1980s computer game Pac-Man, some down-and-outer pranksters Eddie, Joey and Syd (maybe really Tony, Joe and Mathias), a look at attempting to learn German, all with an almost Shakespearean love of inversions and complexities that meanings slither, gasping, through, or else meticulously guided into states of disappearance like the MH370. The allure of Kent’s work is in its tightly entangled linguistic play, where an observation is stretched out, twisted around, bent and peered at from every possible angle. We can’t always follow what he means, as like all poets he invents his own language: American slang, Hopkins-like nouns morphing into verbs, verbs cross-dressing as nouns as if on a Eurovision catwalk, smashed up compound words where we have to intuit meaning from context. In fact in some ways Kent’s poems re-enact the very basis of the invention of language where soundings sing and thump and collapse and collide and parade across the pages, and nothing means, except strait-jacketed into its context , but Kent removes the strait-jacket and ambiguity unconsolingly reigns. He takes jargon from botany, from food writers, from science, from technology, from travel, enlarging the world, then chopping it up again into intricate pieces. The book’s appropriately urban cover – Carrum Station Vending Machine by James Bonnici – depicts in Edward Hopper-type views both the exterior and interior of a train station and its waiting room, the vending machine like a robot deity or dalek, the street lamp behind it glowering over the scene like a scaffold, and the telegraph pole further back resembling a crucifix: Christianity runs through this book like some alternative computer programme that Kent shuffles, uses as sufficiently absurdist theatre, and challenges and discards. And won’t you take a closer look at peanuts? That is, dilemmas of direction are analysed then solved through necessity and curiosity, into a communion over a meal, a communion of data, yet also a spiritual communion. He hovers over difference wherever he can find it, and in his spliced cubist descriptions of everything the picture is vivid – a washing machine at Christmas ‘whirs and brims hot infant light’ – that is, it’s both funny yet profound. God is – literally – in the machine. Kent outlines a theme then personalises it, splitting into narrator and participant, observer and perpetrator, puppet and puppeteer on an eternally precipitous Big Dipper of engineered collisions that echo and pool outwards like the recently picked up pulsations from the original Big Bang – ‘civic brides prepare at the smooch of marriage / in a pre-arranged I do. You did’ – or like John Berryman’s wandering cranky bemused romantic Everyperson, Henry. As also for Berryman’s Henry, the tone is constantly shifting – from studious to hilarious to regretful to celebratory. Nothing settles. convert, create, divide, divert, confide…repeat. And that spilt casket of verbs is a good place to end – from yesterday’s budget cuts of Hockey’s poseur economics of Slash and Burn policies, to Kent’s alternative Utopia of corporeal ‘Pash and Churn’ through an unstoppable hyper-observant brain where every bit of matter observed, every plate of daily bread, is pulsating with clambering life, an unbudgetable splurge of tripping, and renewable, energies that is Sputnik’s Cousin. Eddie Joey and Syd – Ed Kuepper, Joey Ramone, Syd Vicious. Previous: A Story of Gradual Attunement: Alex Chapman reflects on Annamaria Weldon’s ‘The Lake’s Apprentice’. Next: Writers to Prime Minister Tony Abbott: Restore funding to the arts!